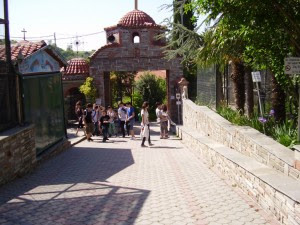 A new partnership is to change present data in religious tourism, after Tourism Minister Olga Kefaloyianni met with the Chairman of the Holy Synod Pilgrimage Tours Bureau of the Church of Greece and Metropolitan of Dodoni to sign a cooperation protocol over the development of religious tourism. This protocol aims at developing an effective cooperation between the church and state. “It has been observed, however, that despite tourism reduction as highlighted in last year’s international conference which was held in Andorra, religious tourism seems to grow,” stated the Metropolitan’s office. Besides its well-known lures of sun and sand and islands and history, Greece has many places of worship, monasteries and churches that stand out for their architecture. The Metropolitan of Dodoni said that religious tourism does not only concern the Orthodox faithful but those of other religions as well and to draw people interested in history and religion.